Stage 4 of the Amgen Tour of California bicycle race may start at Pismo Beach and end at Avila Beach onMay 13, but it will wind its way through about 100 miles of Santa Maria and the Santa Ynez Valley before its 144 cyclists sprint their way to the finish line. The next day’s stage commences along the City of Santa Barbara’s waterfront on Cabrillo Boulevard, which will close Wednesday evening at 6 p.m. to begin the setup for Thursday’s Stage 5 of the eight-day race. 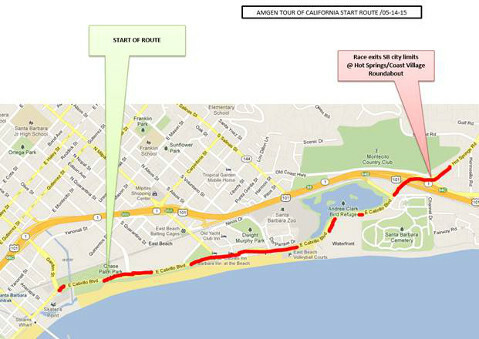 The Amgen Tour of California 2015 will temporarily close Cabrillo Boulevard May 13-14. The North County leg on Wednesday travels through Guadalupe and Orcutt before pouring onto Foxen Canyon Road. The pack will then head up Tepusquet Road, Thompson Avenue, and Corbett Canyon. For South County drivers, the Thursday, May 14 start at 11:55 a.m. on Cabrillo Boulevard is accompanied by a festival and road closures that will begin about 20 minutes before the race. As the pack pelts along State Route 192, en route for SR 150 and Santa Clarita, driveways and streets through Montecito and Carpinteria will be temporarily be closed until the racers pass.